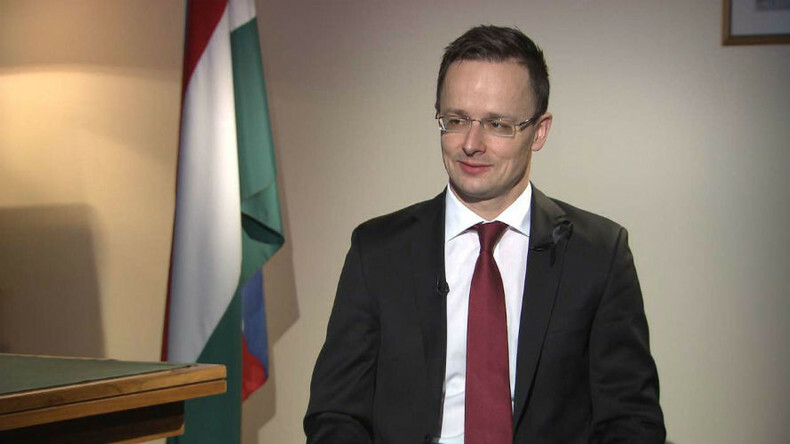 Sophie Shevardnadze: Péter Szijjártó, Hungary’s Foreign MInister, it's great to have you here on our program, welcome. Peter Szijjártó: My pleasure, thank you. SS: So, we'll start with the latest: Budapest has vowed to ‘sweep out’ foreign NGOs funded by American billionaire George Soros. I know that he nowadays funds more than 60 groups like that. How dangerous are those organisations for your country? PS: Actually, there's a very unfair and unjust approach being spread, actually, which tries to say that it is really the NGOs which represent the people of a given country - which is a very dangerous approach, because it's not true. There have never been any elections taking place where NGOs would've run, so there were no people voting for "I want this NGO to represent me or I want that NGO to represent me". People vote on politicians, on political parties. So it's the Parliament and it is the government which represent the people of a given country, so, actually, we think that this approach, that this NGOs would represent the society is very dangerous - number one. Number two, you know, there's a very clear and fair demand towards politics to be transparent and I think that it's not only politics which should be transparent, but all organisation which have an impact on public affairs, on political or social issues, they must be transparent as well, because the people have a right to know whom these NGOs, whom these organisations actually represent. So, that's why we want to say that if there are NGOs in the country which are financed by foreign citizens, by other countries, by other governments - then it should be known to the people. SS: Who are these local groups? You must have some knowledge to be so worried and to close them down.Who do they represent? Because Soros says he will continue working with 'local groups' despite government's opposition. PS: What we say is that they have to be transparent. People have to know that if there are NGOs which would like to influence their opinion, their approach, their understanding towards politics - then these people have to know, whom these are representing. That's what we want to know. SS: Well, who are they? PS: We do know that George Soros finances a lot of organisations in Hungary. He has a very clear, let's say, attempt or a very clear interest, because he has already announced it and spoke about this very openly, that he would like this government to fail, he would like to kind of fire this government because he doesn't like our approach, doesn't like our policies. But, it's not George Soros who has to make that decision, what government leads Hungary, it's the Hungarian people. We find it very anti-democratic, if someone from abroad would like to influence Hungarian voters on whom to vote for. SS: But when George Soros says that more than ever he's going to cooperate with small groups, that in a way means that he's going to go against the government's will. How's that going to play out? PS: He has a very clear intention, that's definitely true, but I think it's an obvious right of the country, obvious right of the government to protect the country from external influence. This is what we have heard a lot from the U.S., for the last months, that external influence is so dangerous, when another country would liek to influence political procedures of another country... So, it's a good reason, if this is american position, it can be our position as well, that if factors - people, persons, businessmen - of another country would like to influence political procedures in other country, from that we have to protect ourselves. SS: If you're saying you're going after NGOs, you can't just go after Soros-funded NGOs, you'll probably will have to go after other NGOs, like Greenpeace as well. Are you ready to do that? PS: My position is that we have to ensure level-playing field. So, double standards - we don't like, and so, actually, there must not be of course a regulation to NGOs which are funded by George Soros, there must be a general regulation on NGOs which oblige to governmental organisations to be transparent and to unveil whom they are funded by. Actually, it's... I wouldn't say 'funny' because it's too serious to say that, but the abbreviation NGO stands for Non-Governmental Organisations, and in many cases it turns out that, maybe, letter "N" is not appropriate there, because many times, other governments or other organisations which are affiliated to other governments, actually fund this kind of organisations. As George Soros had a very clear and tight cooperation with Democrats, with the Clinton family, and he clearly had a strong influence on U.S. foreign policy, he clearly had a strong influence on the policy of the Clinton family - so, actually, I don't think that NGO is the right abbreviation in this regard, because I think considering it a Non-governmental organisation is too much. SS: So this is like a preventive measure more than anything, right? Because you feel like these organisations can really influence your country's foreign policy? PS: I mean, actually, these NGOs can, from externally, can influence internal life - social, political life - of our country, and if this is a case then we have to know who they are. SS: But here's a tricky part, though, because Hungary’s ruling party has also benefited from Soros-funded NGOs, before they came to power - so if it was okay to work with him them, what has changed since? PS: Many of us, many of current political leaders, or politicians, have had scholarships from Soros Foundation and with that many of us have studied abroad - in the U.S. and in the UK. But, I mean, giving scholarships to study abroad, see the world, get skills and experience and come back - is not the same as funding NGOs who are working against the government, these are two totally different things. SS: Incoming American President Donald Trump has been also a very vocal critic of Soros and his NGOs around the globe - do you think with him in the office it's going to be easier for Hungary to "get rid" of these Soros-foundation NGOs in your country? PS: What I can tell you is the following, that in the political relationship between the U.S. and Hungary during recent years, were at the deepest points. There were very clear attempts from the U.S. to interfere in our internal issues. Just to give you an example, I was given a two-page paper from one of the high ranking officials of the State Department during my first visit to the U.S. as a foreign minister. This two-pager contained some measures which the U.S. government expected us to do in Hungary in order to make it possible to enhance the political relationship - but, come on! I mean, it's too much, it's interference in our internal issues, because these papers were not about bilateral cooperation, these were, clearly, about internal issues: laws, regulations in Hungary. Although our economic and defence-military cooperation have been perfect, this political relationship was very bad. So, now, we have hope that this political relationship will improve, and as our position regarding migration, our position regarding the role of foreign policy is pretty similar with Donald Trump, we have a good hope that this political relationship will improve. SS: We're going to talk about U.S.-Hungary relationship in just a bit. Just to finish with Soros, Your party has said that NGOs funded by Soros are working to bring illegal migrants to Hungary - how are they doing this? Why would Soros need so many immigrants in Hungary? PS: What I understand from my colleagues, since I don't supervise intelligence agencies, that there were organisations which helped illegal migrants to find ways to Hungary, to find where they could violate our border, to find out how to apply for asylum status, and these reports have said that George Soros was in the background for these organisations. SS: What's the reasoning behind it? Why would he want all these illegal immigrants in Hungary? PS: Since I'm not him, I cannot tell you about that, I just can tell you what I have heard. SS: I spoke to Ex-president of Czech republic Vaclav Klaus and he actually says that EU elites want an influx of refugees, which is weird, because looking now, I mean the whole refugee problem is about to cost top politicians their seats in Europe... Why are they still so supportive of this open-door policy? What do you think? PS: I wouldn't speak about refugees, I would speak about migrants, because we are bordered with, from South, we are boarded with peaceful countries - Croatia, Serbia, from where migrants have entered Hungary, like 400,000 people, in 2015. I mean, how can someone be considered a refugee in Hungary, who comes from Serbia or comes from Croatia to Hungary? I mean, there's no war in Croatia, no war in Serbia, so I think that these people might not be considered as refugees. They might be considered as refugees in the neighboring country where they escape from if there's war there, but definitely not in Serbia, Hungary, Croatia, Macedonia. So, why the EU carries out this open-door policy? You should ask the high-ranking officials in Brussels, but I know that this is a bad policy. It's harming the EU, it's dangerous, because this policy of open borders undermines security and safety in Europe. Currently, we are experiencing a threat of terror more serious than ever in Europe, 1.5 mn illegal migrants entered the territory of the EU - we don't even know who they are! And our question was whether this fact gives the opportunity for terrorist organisations to send their terrorists to Europe or not - but if you speak like this, you're going to be attacked immediately in the Western European media saying that you said that 'migration equals terrorism', which you've never said. But we say that, yes, this uncontrolled and unregulated massive influx of migrants gave the opportunity for terrorist organisations to send their terrorists to Europe. SS: I feel like Western countries could’ve presented a counter-argument - for instance, if we take just your country, your police has arrested - if I'm correct - a Belgian and a Frenchman, who were going to join ISIS, they weren't refugees, and the last terror attack in Budapest was also committed by a local guy, a hungarian guy. So, they will tell you that terrorism is not necessarily a refugee or a migrant thing, it's a homegrown thing. PS: It can be homegrown, but my question is that if there's a massive influx of 1.5 mn people without knowing who they are - with opening green borders to them, saying 'please come on in', without controlling them - does it give the opportunity for terrorist organisations to send their terrorists easily to Europe? Yes, it does, and actually, this whole migration crisis has made it very clear that old taboos and dogmas must be overcome. So, so far, you better did not speak about unsuccessful patterns of immigration in European Union, in Western Europe - but now, it turned out that, yes, there have been 'double societies' or 'parallel societies' constructed, there are problems with integration of former migrants into Western European societies. We have to speak about this openly. We think that this 'solution' based on quotas is totally unimplementable, it's totally against common sense. We have to be able to protect ourselves. We have to be able to make a decision whom we let to enter the territory of our country and whom we do not let that. SS: So let's talk about the mandatory quotas that Hungary refuses to obey. Luxembourg's Foreign Minister actually even said that you should be excluded from the EU for that. Aren't you worried at all that this may lead to that if you disobey Brussels? PS: No, of course, because the decision about obligatory or mandatory quotas is breaking European regulations, because a mandatory quota system means the amendment of the Dublin treaty and the Dublin treaty cannot be amended by a majority decision of the Ministers of the Interior. If you would like to change the treaties, then you have to go through a very complicated process with national ratifications, Parliament ratifications at the very end. So this decision about mandatory quotas is unimplementable because, just put into consideration Hungary - we are a Schengen member-state, so if there's a decision that a number of ex-migrants have to be settled in Hungary, then the next day they can leave Hungary towards Slovakia or Austria without any problem, because we are a Schengen zone country - number one. Number two it's against common sense, because an obligatory quota is kind of an encouragement, an invitation to people to Europe, because they're going to be redistributed instead of stopping the influx. And, number three, it's breaking European regulations. These three reasons are enough for us to go the European court to challenge this ruling. SS: Just because this "open door" policy is so widely saluted by the Western states, when your PM, Mr. Orban, comes out and says "bringing in migrants to my country equals to national suicide" - I'm thinking, maybe, it's a little bit of a stretch, because, I mean, mandatory quotas if you obey them, would only, maybe, bring like what, 1300 migrants to your country? I mean, your country has 10 mn people, is it really like a "national suicide"? PS: There are tricks in that. First, it was said in Brussels that, OK, there will be a quotas system, but voluntary. Then it was said, OK, quotas system is now not voluntary, but mandatory. Then it was said, OK, it will be a mandatory quota of about a 120 thousand. Then it was said, yeah, mandatory quota is 160 thousand and then, financial penalty to those who don't oblige... So, these are tricks, and it's very clear and obvious that the Western European political elites, that Brussels, the institutions want more and more people to come, want an unlimited illegal migration to the EU, for which mandatory quotas would be the gate opener, and we just simply don't want it. SS: You've turned into one of the main transit hubs for hundreds of thousands of migrants and your country was criticised for putting up fences, but you weren't the only one - there are Austria, Slovakia, Sweden, Denmark, we have Belgium, who also introduced controls... Is this the only way, to put up fences? PS: We are a member of the Schengen zone, which means that there's a free movement inside the Schengen zone, if you cross the borders - according to regulation. But, in order to be able to preserve that, you have to protect yourself externally. So when you join the Schengen zone, then you sign up for some obligations. We have an external border, and the Schengen code says that if you're located at the external border, you have to make sure that your border is only crossed through the official border crossing points, during opening hours - it even said, 'during opening hours'! So, we have more than 500 km of land border, mainly flat, towards Croatia, towards Serbia - so no Schengen member states... There's no other possibility than some physical obstacle to comply with the Schengen regulations. You know, when this whole crisis broke out, we posed the question in Brussels, whether this extraordinary situation gives us the excuse not to comply with Schengen regulations, and they said "No, no, you have to comply with all of the regulations!" - then we put up the fence, to comply with the regulations, and then we were accused very badly. So, it's tragic, I'll say. SS: Are you pro-Schengen or against Schengen? Because after tragic string of terrorist attacks in Europe, After the Berlin Christmas attacker was shot in Italy, countries like Italy or France started talking about maybe going back to former European borders, because desperate times call for desperate measures. What do you think should be done? Should you go back to former European borders? PS: We are pretty much interested in preserving the Schengen zone, because if the Schengen zone collapses, then it's a suicide for the European economy. European industry is mainly based on methodology of adjusting-sequence and adjusting-type production, which means that we need the free movement for goods and products. If you cannot insure that, then the whole European economy will suffer huge losses. So, our interest is to keep Schengen zone, but in order to be able to keep Schengen, to maintain Schengen zone, we have to strengthen the external protection of the Schengen zone. That's what we have been working on, and that's why we don't like this kind of double standards, you know, that many times you're accused of protecting the external border and on the other hand, saying that the Schengen zone might die because there are too many people coming. SS: You also said that by protecting its borders Hungary is protecting Europe, Europe's security, especially Germany - is your country getting any help from the EU, being at the forefront of the all of this? PS: Very minimum. The only serious support we received from our Central European friends, so it was about sealing of our green border - you know, because many times it is said that we close our borders, it's not true, because we have border-crossing ports where you can enter the territory of the country - of course, respecting the regulations. When sealed off the green border, there were only three countries - Poland, Czech Republic and Slovakia, who have helped us with technical assistance and human resources, manpower. Only three countries. SS: Your government wants to take it an extra stretch further and wants to limit the freedom of movement of those migrants who are already in Hungary. PM Orban has come out and said that he understands that this really "goes against all European", but he's still willing to take the risk. How will the EU retaliate if Hungary does go against rules? PS: There's a very heavy contradiction in European Union, because Dublin treaty says that if you enter the territory of the European Union illegally and if you submit request for asylum, you have to stay on the territory of that given country, wait until your procedure is over, and the decision is made whether you get asylum status or not. So, these people, who enter territory of Hungary, submitted asylum requests, and they left immediately. Because of European regulations you cannot keep them, but on the other hand, the European Union obliges you to comply with the Dublin treaty, which says that they have to stay on the soil of your country, but I mean, if you cannot make any kind of measures in order to keep them there, then how to comply with the European regulations? So, from our perspective, this was the reasoning for this proposal. SS: I want to talk a bit about the new President of America, Donald Trump. EU officials reacted adversely to his election, however, your PM was very enthusiastic about him being the new President and even got an invitation to visit Washington - do you think Orban's friendship with Trump will further complicate Hungary's relations with the EU? PS: I don't think that, because you will see that all European politicians are looking for friendship with Donald Trump, of course, because whether they like it or not, he's the President of the U.S., and I see that there's a huge frustration within the Western European and liberal American political elite, that it turned out very clearly that it's not them, it's not liberal Western media, it's not liberal Western political elites, but the American citizens who make a decision who's going to be the President of the U.S.. I can tell you that if a Democrat, if a Liberal president said the same things as Donald Trump has said, then the whole European media would celebrate him "as such a progressive, such a wonderful, such a smart guy"!, but because it's Donald Trump, now he's bashed in every sentence, which I don't think would be fair and correct. Yeah, we were enthusiastic, we were happy with him winning, although it had nothing to do with us, because it's American citizens, and we would have respected that decision anyhow - but, of course, we were happy with his election victory because of two main issues, that regarding migration and foreign policy we represent position pretty similar to his position. SS: And elections are coming up also in France, Germany, in the Netherlands and... I mean, everyone sees this shift to the right, and even though the people that are anti-establishment forces, may not win this elections - do you feel like Europe will continue business as usual, or this new political forces have the power to change the EU from within? PS: There's a very serious debate going on, within the EU, about the future of the EU, and it's no wonder - these are challenging times. There's a kind of fight or debate between two camps - sovereignists and federalists. We say - we belong to the sovereignists, of course -that European Union can only be strong if the member-states are strong, and there should be no more authority brought to the level of Brussels. If there are more and more governments saying this, then, of course, it will come to a change within the EU. All of us, all 28, agree that we want strong European Union. The only question is - how to get there? Our position is that only strong member-states can lead to a strong European Union. PS: We were always very clear that were unhappy with the sanctions, because we see no forward progress regarding Minsk agreements, because of sanctions. We see many damages caused to European economies, including Hungarian economy. So, I think, sanctions have been proven unsuccessful, although we never used our veto right because we didn't want to break the European unity - but I really do hope that in the future, at least, there will be a possibility to re-evaluate the sanctions, to have a highest possible level of discussion about the impacts of the sanctions. So far, it was not given, unfortunately, and I really do hope that there will be a more pragmatic, more rational cooperation between U.S. and Russia, there will be more strategic cooperation between these two countries, and if this is the case, then I really do hope that the European approach will change as well. SS: Foreign Minister, thank you very much, for this interview. Good luck with everything.